Eye On France: Here Comes B-Day! As we start the countdown to next Friday, 12 April, the first of the newly-agreed Brexit deadlines, the French papers are full of either exasperated or simply exhausted speculation about what might happen next in the effort to get rid of Theresa May and her rowdy parliamentary colleagues. B-Day is approaching. Or is it? On Friday next, 12 April, unless Mother Theresa can come up with a miracle and force her cantankerous Conservative cohorts into a semblance of parliamentary order, the United Kingdom will crash out of the European Union in a no-deal Brexit. The sky will finally have fallen. The soothsayers at the French newspapers are divided in their predictions. Business daily Les Echos says that the cost of such a scenario would be so enormous for Europe in economic and security terms, that the remaining European leaders are unlikely to allow it to happen. Les Echos is thus betting on extra time. Right-wing Le Figaro, in contrast, says a no-deal departure is now “more likely” than ever before. Left-leaning Libération is less sure. Theresa May has asked for an extension until 30 June, because she couldn't batter the bullies in her own party into shape by the original exit date of 29 March, and probably won't put manners on them by either of the original extensions, 12 April or 22 May. 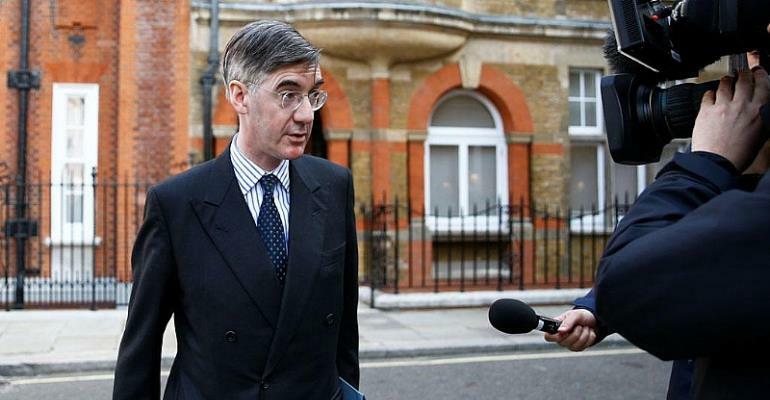 How will we ever forget Jacob Rees-Mogg, a man who acts, speaks and looks as if he's just escaped from a dodgy Monty Python “Posh Dope” sketch? He has promised to make European political life impossible in the event of the UK being “forced” into a further delay. This sort of sabotage would involve vetoing the long-term budget, the multiannual financial framework, which sets out EU financial form until 2027. The point, Rees-Mogg says with a smirk, is to cause “maximum inconvenience to the European Union”. The same mook has also ridiculed French President Emmanuel Macron's calls for further integration of the European family. Rees-Mogg says: “Monsieur Macron has come up with a whole slew of new plans to have a more integrated European Union. He wants to tie the whole thing more tightly together as a follow-up, essentially, to the euro. “But that would require treaty change and we would be able to obstruct that. And a European Union army would also require treaty change. French paper Libération says Rees-Mogg is obviously trying to annoy Europe in general, and Emmanuel Macron in particular, so that the 27 will kick the UK out with no further delay. It could well work. Right now, France wants an immediate end to the whole shambles, with the president's office saying there should be no talk of an extension to the extension until London can present a “credible alternative plan”. The Dutch prime minister, Mark Rutte, is also against any prolongation. He says the basic problem is that the British electorate is deeply divided on what the House of Commons and the parties which sit there are supposed to do. And that's not going to be resolved by an extra extension. On the economic front, Europe can not really afford a no-deal Brexit. If you doubt the truth of that, says Les Echos, just look at the current problems of the German car sector, and the slow growth of all 27 member economies. Then there's the question of the political stability of the island of Ireland, divided between a departing North and a remaining Republic. What are the implications of formal separation from a nuclear power, and one with a veto on the UN Security Council? How will Europe deal with the commercial competition proposed by the departed Brits? And why cut the continent off from London, the true financial heart of Europe? Those questions alone suggest that Friday will come and go, like the March deadline, without any dramatic change. The Brits will still be on the way out, but at their own rate and on their own terms. And the rest of Europe will, not for the first time, have to grin and bear it. The crucial question really is, how long can we put up with Jacob Rees-Mogg? In my own case, it's a matter of days!